Life has been busy here with Gregory teething and my husband doing his full-time internship, approaching law school graduation. I joined a local mother's group and I am pretty excited to meet new people - they do some sort of get-together every day! Gregory's bottom two teeth finally came up and now he is much happier. When he was crying and having such a hard time of it, I didn't get anything done (including sleeping). So the sewing has been a little slow lately. But now he is much happier and taking naps again and I am ready to get back to it. I really do like quilting books a lot because they are so interesting to look through and I enjoy trying to visualize how I would interpret any kind of pattern. But it's been a while since I have bought any because now that I have discovered the modern quilting world and the hundred's of blogs out there - I approach quilting in a whole different way. I used to pick out the pattern, pick the fabrics, and sew. Now - I really like to start making a quilt based on the fabrics I have and like, THEN I start to compose a pattern -usually visualizing it in my head or drawing sketches, for weeks at a time. And lately I have been trying to do patterns that are more about individual blocks rather than strip piecing, for example. So anyway, I saw this book Material Obsession: Modern Quilts with Traditional Roots by Kathy Doughty and Sarah Fielke at Barnes and Nobles a few weeks ago. I never buy books for full price at book stores, so I was happy to see it later at Joann's when I could use my 50% off coupon. 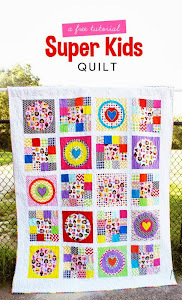 A big reason why I wasn't fully willing to pay the full $25 for it is because I really want to make only one quilt in it, the one pictured here on the cover. This quilt, in my opinion, is a real show-stopper. I love absolutely everything about it but am especially in love with the uses of red and white polka dots, the scrappy element, and the idea of using an overall dot print rather than a solid. Someone in my Chelmsford quilt guild made one like this with lavendar polka dots and it was one of the best quilts I have ever seen. This quilt has a lot of challenging elements for me: applique and curves. But I really want to challenge myself and force myself to be patient. For a while, I was only sewing plushies and purses because I wanted the instant gratification of having a project finished quickly. But I know it would feel really awesome to tackle a difficult technique, learn something new, and hopefully become good at it. Look at what these amazing quilters are doing here, here, and here. These are the type of projects that take TIME but will be/are worth it. I do have to say that it may be a little while before I can justify buying 8+ yards of fabric (the polka dots) for this quilt, but I have plenty of complementing fabrics to do the dresden plates. So in the above picture, I had to throw in a daisy print from the Katie Jump Rope line. I received this half yard cut in a swap and have to say that I am in LOVE. I'd only seen this fabric online and wasn't that impressed. Seeing it in person - wow, the colors are so rich and vibrant and the daisy bunches are more dense than I thought they were. The fabric is amazingly soft too. I love to support local quilt shops and not buy so much online - but there are only a few in my area (none of them closer than 30 mins away), they rarely carry what I am looking for, and the prices are not terribly competitive. Buying online is a mixed bag - sometimes there are errors in your order, you risk losing a package in the mail, but the most annoying thing is that you can't really tell what a fabric is really like until you see it in person..... How do you prefer to buy your fabric? People in my online fabric swap group are "mad for Munki." What is Munki, you ask? Well, I had to get some education on the topic myself. A well-loved fabric designer, Heather Ross, designs adorable designs for a women's sleepwear company - Munki. Heather Ross fanatics actually buy cut up pieces of pajamas to put into their quilts and other homemade goodies. The p.j. 's are not cheap - starting at $70. You can get pieces on Etsy for between $7-$12. And rumor has it that these pajamas occasionally show up at TJ Maxx and Marshall's for $20 or under. I am not going to get into this Munki craze, but gave in when I saw this print: For some reason, I am really drawn to fabrics that have "names" under the characters portrayed. (See a previous post ). This picture what the above fabric really is, the back of a very large women's p.j. top. Here's another awesome swap I received - purple Echino prints. The colors are just so rich. Okay, so now I officially have 4 unfinished quilts hanging in my closet. Do I dare attempt free motion quilting on my machine? Take that long-arm quilting class? Or wait till we are independently wealthy and can afford a LAQM plus the space, so I can just do the quilting myself? This project came together pretty quickly and it was a lot of fun. Missy, hopefully you read this soon and I can get going on your purse. I do like this combination- and these are all of the fabrics you mentioned liking. Let me know what you think. Okay, before I can get making the purse for my SIL, I am going to finish a simple baby girl quilt. Choosing the fabrics is often the most enjoyable part. I love the combination of pink and green. It's kind of ironic that I have the largest stash of pink than any other color and I am a mother of a young baby boy! Which ones will she choose? Cast your vote soon so I can get sewing! This is the first time in a while that I have stepped out of my "box" and made some quilt blocks out of fabrics from different collections/designers. I really love it. 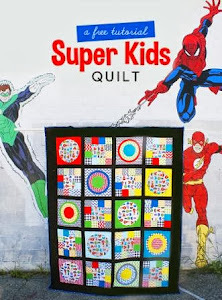 When I first discovered this world of modern quilting and fabrics, I initially thought that I had to make quilts consisting completely of one collection, but this thinking has left me with some disappointing results. I made the pink/green/blue argyle version as a "practice" but found that the two different kinds of socks were quite different to work with. I can give everyone a few tips about making softies: break-up the stuffing/fiberfill into smaller chunks and this will lessen the bunching within the toy that creates the "muscular effect." Also, I ended up putting cardboard inserts into the other monkey's ears because they were really jagged, due to the stretchiness of the sock material. I opted not to do the cardboard inserts for this little guy because his ears are so big, I worried they would look like wings. Is a blog post complete without a picture of my little one? He actually really likes this toy and has been sucking on the ear, leg, and arm. I have his quilt on the floor in the living room because he's too little to sleep with it but I couldn't wait to get some use out of it! I recently bought a clearance quilt kit that had a lot of great fabrics, including discontinued Flea Market Fancy, Amy Butler, and Heather Ross. It also had some normal colored solids and a light green spotted print. But lurking amongst those useful items, was this: My friend thought it was a floral, I thought it might be some sort of psychadelic sunset, but instead, it was DUCKS!!!! I know there's a lot of ugly fabric out there, but this has definitely got to be one of the front-runners. Here's a peek at the pretties I got at our last New England Quilt Guild Meeting. I have to reiterate my excitement about this group. Everyone is just so nice, friendly, and down to earth. I volunteered to be an officer - just to make myself get to know people better and maybe share some ideas. I will be working with a few other ladies in the role as vice president. Not sure of what it all entails, but I am excited. This little gal broke into my parent's house over the weekend...... She took a ride on the tire swing. She wanted to slide into the pool, but was disappointed to discover that it was covered up. She took a little nap on the hammock. She called me when she got up too high in the tree, so I saved her.